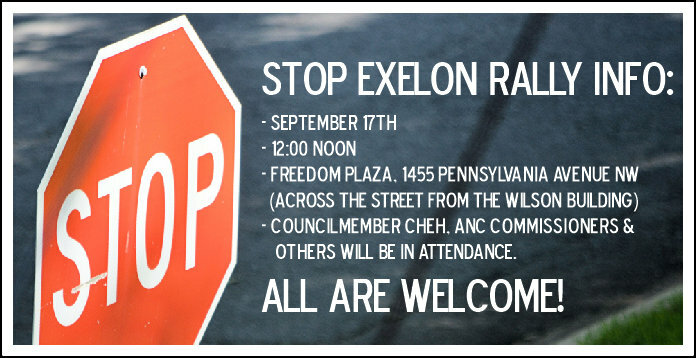 DCEN: Help Us Send Exelon Home! 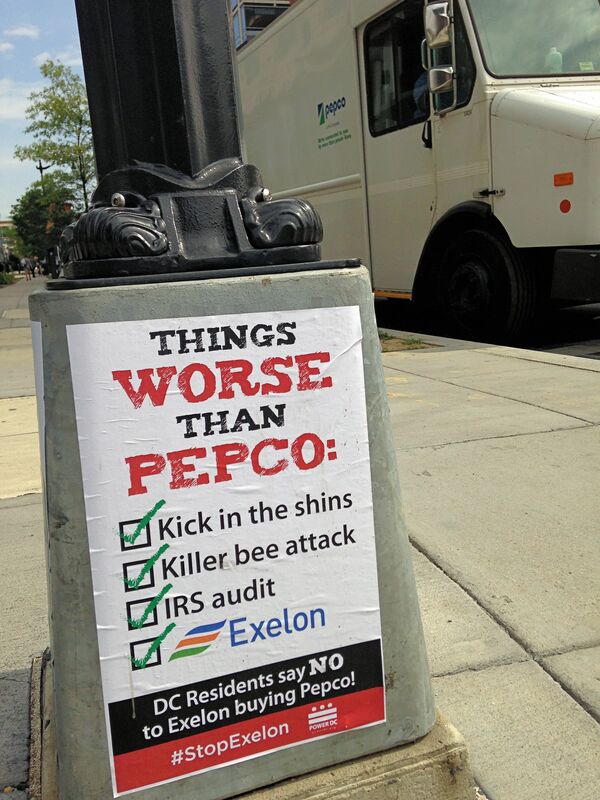 As you know, on August 24th, the efforts of Councilmember Mary Cheh, 27 Advisory Neighborhood Commissions, thousands of District citizens, and many others, were rewarded when DC’s Public Service Commission (PSC) rejected the merger between Exelon and Pepco. There was similar opposition to the merger in Maryland, Virginia, New Jersey and Delaware, the other Pepco jurisdictions, but what the District had, that they did not, was a Mayor that was unwilling to settle with a nuclear power plants operator with a history of raising rates and opposing clean, efficient energy. This mayor was Muriel Bowser. 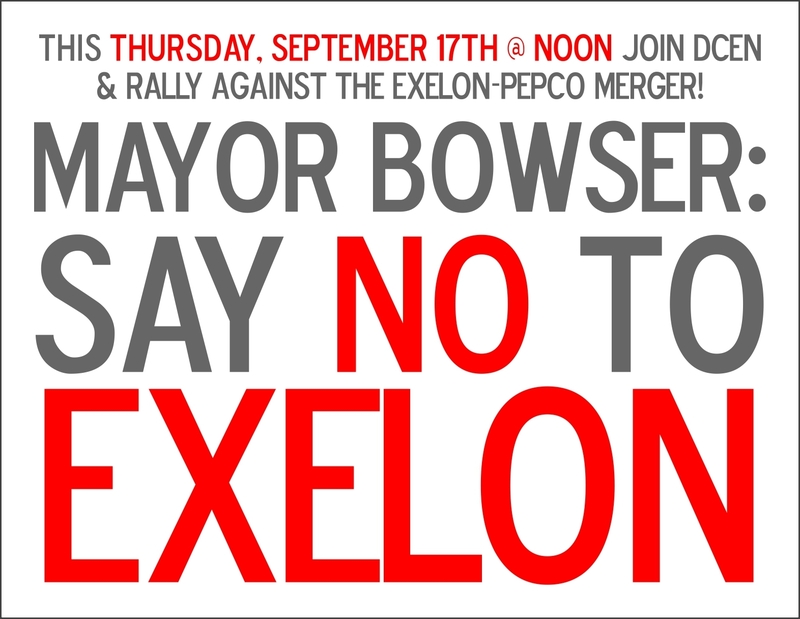 Join us September 17th at NOON and tell Mayor Bowser to Say No to Exelon! Now the corporate power elite in the District, including the Federal City Council and the Greater Washington Board of Trade, and others, are putting an immense amount of pressure on Mayor Bowser to reverse the decision of the PSC and develop a settlement, which in effect could help turn-around Exelon’s earlier defeat. We need to tell Mayor Bowser that we will stand behind her if she continues to show leadership by not settling, in any way, with Exelon, and instead, use her skills and position as Mayor, to be a national leader, and move the District towards the promise of reliable, affordable and clean energy. This is something Exelon cannot help the District achieve. Nothing has changed that would support doing anything else. The DC Public Service Commission made the right decision that this merger is NOT in the public interest. Exelon is NOT going to change their historical precedent of raising rates, taking away local control, and opposing meaningful progress to create a clean energy future.